All University of Iowa printing and copying must go through UI Printing Services. Please see the UI Operations Manual for more information about this policy. We provide typesetting, page layout, printing, and binding services. Our digital and offset color printing technology, all on line, includes large-format color for posters and displays. Document files may be sent through the web - we can help you set up, save, and send them electronically. We also oversee the bid process for orders that we determine should be printed off campus, serving as liaison with the vendors. This depends on the quantity to be printed, the dimensions of the paper sheet, the print quality needed, whether the job involves color printing, and the date it must be finished. 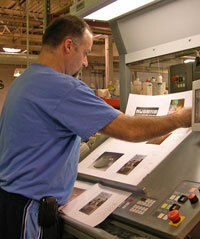 The Copy Centers print black toner on 11x17-inch or smaller paper, with 24-hour, or less, turnaround the norm. Printing Services produces black-and-white and color documents in larger quantities on paper sizes that can exceed 11x17 inches; that may need editorial services; that use halftones or need precise registration; and that allow for longer turnaround time. Please contact us before you begin your printing project! We can guide you through the process from start to finish, saving you time and money. We are your one-stop shop when it comes to all your printing needs, helping you do MORE with LESS! To help support sustainability at The University of Iowa, Printing Services is using online statements instead of paper. Order business cards on line!